Based on the novel by Stewart O’Nan, Snow Angels tells parallel stories of people in a small Pennsylvania town. Director David Gordon Green (George Washington, Undertow) starts with a bit of humor at the expense of a high school marching band, but this story is mostly a desperate, realistic drama, which is what Green does best. Glenn (Sam Rockwell) is recovering from a bad separation, living in his parent’s house, and seeking easy help from Jesus. He loves his 5-year old daughter dearly, but his ex (Kate Beckinsale) doesn’t trust him. She thinks he will do something stupid like leaving the girl in the car. Annie’s fears are justified, but they also cause her to see neglect and abuse in the tiniest lapse of judgment. And it’s not like Annie is in the running for Mother of the Year, either. 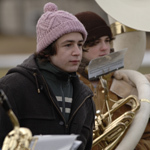 Making the tenuous connection to the other story is high-schooler Arthur Parkinson (Michael Angarano), who works at the local Chinese restaurant with Annie, who used to be his babysitter. Arthur’s parents are also going through a separation, but it’s much less painful than Glenn and Annie’s. Mom and dad are on friendly, if chilly, terms. There is enough money for Mom to raise Arthur in their colonial two-story, with enough left for Dad to rent a lonely and sparse house in the beige cookie-cutter subdivision. The central conflict has to do with a tragedy that involves both of the families. Nobody is to blame, but it affects all of them. It drives Glenn and Annie into despair. They push each other around in a terrible spiral of pain, frustration, and cruelty. Glenn seeks love and reconciliation from Annie; she gives him mistrust and anger; he retaliates with jealousy and cutting remarks. For the Parkinson family, however, as painful as it is, the lines of communication are open, and they all react with emotional maturity. The tragedy actually helps to bring the family closer. Poverty is correlated with lots of things that will shorten your life expectancy — stress, sleep hygiene, smoking, diet.... Snow Angels is a believable dramatic presentation of how two families whose key difference is wealth can live in completely different worlds, even though they live in the same town, attend the same schools, and work at the same jobs. One family is healthy and self-healing; the other is dangerous and self-destructive. That makes Snow Angels a fairly interesting movie, at least for a while. It stops being interesting as soon as you realize it can be summed up in the above paragraph. Unlike some of Green’s other work, Snow Angels doesn’t ring in your head for days. There are no interesting paradoxes or gray areas to ponder after the film. The lesson seems to be “don’t be poor, you’ll live longer” which is great advice, but hardly thought-provoking (or practical). Green’s other forte is capturing the spirit of an unglamorous place, whether it’s the junkyard in Undertow or the railyard in George Washington. I didn’t get as powerful a sense of place in Snow Angels as I did in his previous films. There were diverse settings, but I never quite knew how they all connected to make a single landscape. And because the town was a more middle-class place, it wasn’t as exotic as some of the Southern settings Green has used before. I liked Snow Angels. I liked how well its depiction of class correlated with my own musings and research. There isn’t a misstep anywhere — from writing to acting to editing — that pulls you out of the movie, until the very end. I am almost certain the author ended the book the same way, but it’s an ending that I tend to attribute to writers block. It’s dramatic and somewhat plausible, and it’s even handled more gracefully than usual in this film. But it’s a device that is unsatisfying; a good storyteller ought to be able to do better. Regardless of the ending, Snow Angels is tough to recommend. It’s a gritty, realistic drama with only enough humor and romance (Arthur’s girlfriend is a nerdy charmer) to remind you there are other movies you could be watching. The spiral of emotional pain for half of the film’s characters is probably too grim for casual moviegoers to embrace, yet not poetic enough for the art-housers to embrace. It’s not a bad film, but it may never find an audience.